Fast forward 3+ years, and artists and revolutionaries in Egypt are facing uncertain times. On May 29, after a two-day election, a new leader — Abdel Fattah-Sisi, head of the Supreme Council of the Armed Forces (SCAF) — was elected Egypt’s president. Support for SCAF has created divisions between revolutionaries in Egypt, and the leaders of SCAF have often been a focus of Ganzeer’s work. Today, Egypt is undergoing a counter-revolution driven by the supporters of the Egyptian Muslim Brotherhood, which believes former President Morsi’s ouster — as demanded by many Egyptians in July 2013 and enforced by the army — was unwarranted. This accusation has led them to be labelled as “terrorists” who are now facing mass trials and much worse. In addition, the government has been widely criticized by human rights groups for the mass arrests of protesters and members of the media. But the ongoing revolution hasn’t stopped Ganzeer from fighting for positive changes in Egypt’s future. I interviewed him to discuss the role of art in Egypt’s struggles. He also talks about his childhood pleasures and the daily issues he faced as a resident of one of the world’s largest metropolises, Cairo. BHE: Did you grow up in Cairo, and what were some of the best things about growing up in the city? Ganzeer: Yeah, I grew up in Cairo, in a little neighborhood in Heliopolis called Ard El-Golf, which is right behind the abandoned Baron Empain Palace constructed in 1911. It’s far from the hustle and bustle of Downtown Cairo, or even Egypt’s lifeline — the Nile River. I feel like I never really got a taste of “city life” till much later. Today Ard El-Golf is a go-to hangout area, with many popular cafes, sushi spots, high cake-like buildings and what have you. But back in the 80s / 90s it was pretty much a semi-quiet residential neighborhood with many stray dogs befriended by me and other kids my age. My school was around the block and the couple friends I made were in the neighborhood. I feel like I only really faced the city — understood the scope of the city and all that — when I had to go to college which was in a town called Banha, a 30-minute train ride from Cairo. I would have to spend roughly an hour and half in public transportation just to get to the train station. I don’t think I’m a big city kinda guy. I find myself much more comfortable in more intimate communities that are more connected with nature. But don’t get me wrong! I am fascinated by cities, and megacities, and how they function. Cairo’s crazy in just the layers of history that are apparent in every facet of the city. The architecture, the food, the conversations, it’s such a culturally rich city but it’s also one that carries a lot of baggage. What are some of the most important things that are needed for a better quality of living in Cairo and Egypt right now? First off, about seventy-five percent less people! There’s no way any city on the planet can accommodate [over] twenty million people. The number of people living in Cairo are having such a huge toll on the transportation system, the architecture, the environment. On the urban planning front, the city just can’t keep up — it’s always much, much behind. I’d put most of the development money into the rest of the country’s towns and villages, get people to decentralize and spread out. Secondly, private cars need to be banned. Of course, it’s difficult to get around a city and spread out in Cairo without a car, but seriously, it’s just out of hand. I understand that it’s easier for the government in the short run to let people buy cars (making money in the process), but in the long run, it becomes unbearable for everyone. The city really needs to ban cars and focus entirely on developing its public transportation options to reach capacity and maintenance. Thirdly, all this stuff should be running on solar energy or electricity or whatever. I’ve seen solar energy panels cladding the roofs of farm houses in freakin’ Germany. GERMANY… it’s cloudy most of the year. But in Cairo, the sun shines bright even in winter. It’s just dumb to depend on gas the way we [all] do. It’s the only way if we don’t want our people [in Egypt] to all drop dead and die from lung disease, which by the way, a lot of us already suffer from. And lastly, water canals. It’s ridiculous to grow up in some part of the city two hours away from the Nile, yet have no direct access to it, and to only read about the Nile and its significance in history books. If they expect to teach us the importance of the Nile and our historical connection to it, then whenever a new extension of the city is planned, a Nile artery should be the first thing in that plan. Plus, it would offer a good alternative to getting around the city, much better than overcrowded asphalt roads (which discharge so much heat throughout Egypt’s extended summer months). Did you ever join the sit-ins in Tahrir or any protest gathering points in Cairo? What was it like for you? I just so happened to be there on January 25, 2011, when the revolution first broke out, and boy it was the most thrilling and exhilarating time of my life. Seeing people band together and sacrifice themselves in the face of armed troops, with nothing but their voices, and all for what? For other people, people they don’t even know, future generations they will never meet. It was such a glorious thing to experience, the closest thing I’ve ever experienced to seeing God or something. Indescribable. When did you first realize that you enjoyed art? [When] I was about four or five years old. My older brothers had lots of Dungeons and Dragons catalogs, and Nintendo game cartridges, and superhero comic books, and I was just always fascinated by the art in those things and would spend many hours trying to copy them. What’s the first work you did on the walls of Cairo as part of the Revolution? The very first thing I did was not at all planned. Nor was it an artwork at all really. But being in Tahrir Square on January 25th when the revolution broke out, and just so happening to have a can of spray paint, I climbed an NDP (Mubarak’s National Democratic Party) billboard in the middle of Tahrir Square and spray painted what people were chanting: “Down with Mubarak.” The crowd erupted with cheers and whistles. 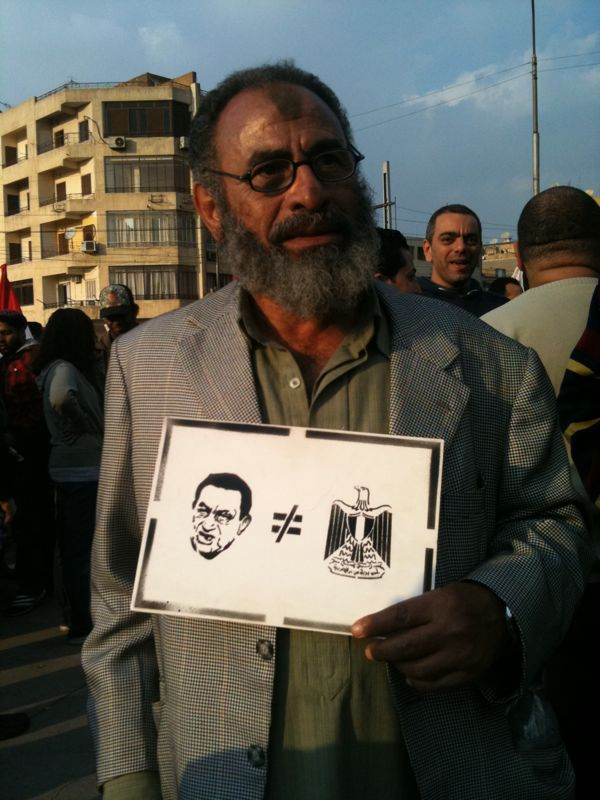 The first “artwork” I created, however, was on February 2nd — a black stencil of visual symbols that pretty much visually stated that Mubarak does not equal Egypt. This was after Mubarak’s second public speech since the revolution broke out — a highly emotionally charged one that many, many, people were actually starting to fall for. 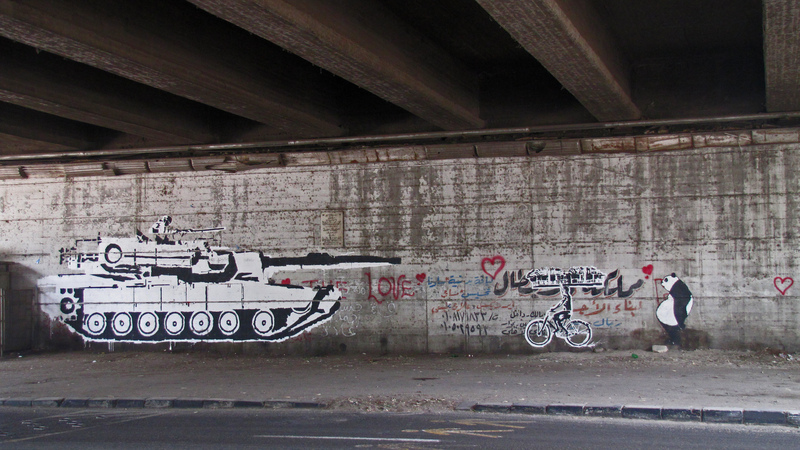 Was street art common in any part of Cairo before the revolution? How did people react to it before the Revolution? Not really. Just a handful of rather content-less stuff in Heliopolis and Alexandria [Egypt’s second largest city]. Very cool and pretty to look at but without much meaning to it. Egyptian jail cells have gained a notoriously bad reputation in the world’s eyes since the Revolution began in January 2011. For your work as a multi-medium artist helping the Revolution you were briefly arrested. Would you be able to tell me about your experience and how it happened? So far, I’ve been lucky enough to not have to set foot in a jail cell at all. When I was detained, I was welcomed into the office of a high-ranking military officer who offered me a soda and later in the day a Nescafé. They were all eerily very nice and I was released on the very same day. Read more about the incident in Ganzeer’s own words here. Much of your work is critical of (SCAF) or establishments — e.g., political, religious, and art establishments — that oppose freedom or change and growth. Have you faced a lot of negative reaction to your work by these groups? All the time. Hardly anything I do is not met with a negative reaction from someone [such as Ibn Salaama]. Yes. Particularly SCAF and the Muslim Brotherhood, as well as Salafist groups. 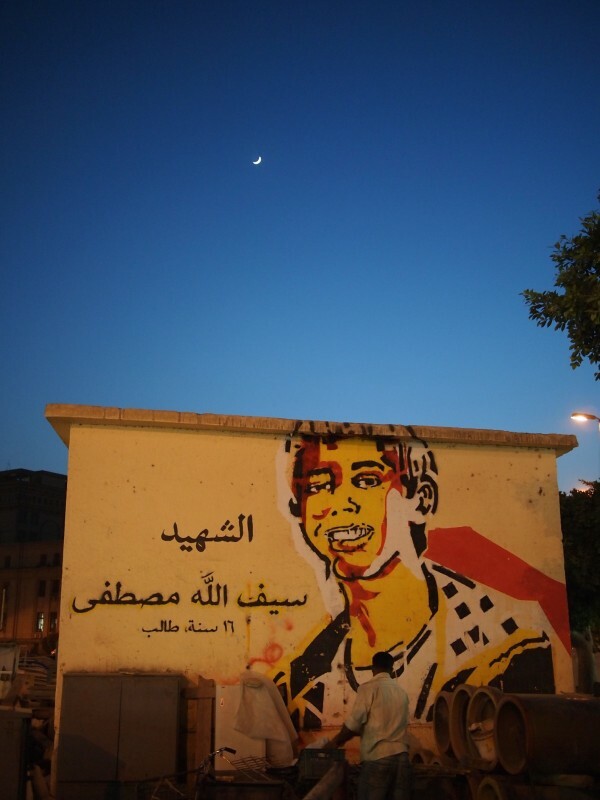 How do you feel about the proposed law to ban graffiti in Egypt and send accused artists to jail for four years? Do you fear being a target? Well, it’s not like the revolution itself was ever legal. It was illegal but we did it anyway. And it’s not like doing graffiti was a totally safe game up to this point either. One could easily have been charged with plotting against the state with the type of graffiti we’ve been doing so y’know…we’ll always try and do what we think is the right thing to do even if the government oppresses us. It’s always been that way anyway. Check out Ganzeer’s recent projects and activities here.